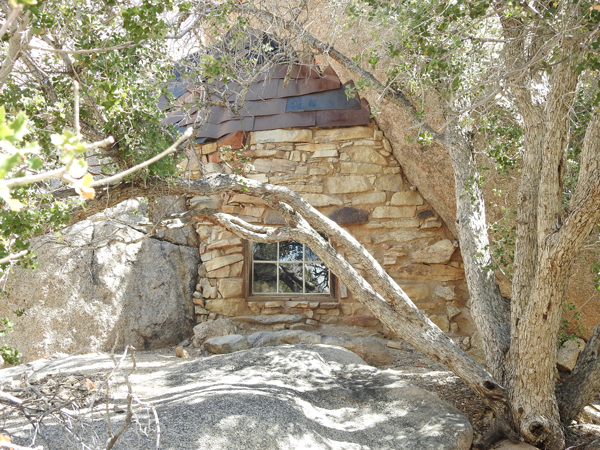 June 12, 2018 Alice W.
The old house at Eagle Cliff Mine at Joshua Tree National Park--a symbol of resilience and creativity in the desert. Thank you for reading my weekly newsletter. I hope that I can add something of interest and value to your day. Today, I want to tell you about two miracles. Of course, for many of you holistic clinicians, miracles happen all the time in your practices, so these stories are not really miracles, they are simply a manifestation of a different healing approach. With more information and tools to work with, miraculous healing can be ordinary occurrences. The first miracle is about a patient who had suffered from bipolar disorder, panic attacks, and depression for over 16 years. She initially came to my practice two years ago, taking Seroquel, Lorazepam, Lithium, Lexapro, and Nature Throid. She has worked hard and has successfully come off all her medications! Her last one, Seroquel, was stopped in July 2017, and she has been thriving. Here is her story: Healing from Bipolar Disorder and Safely Withdrawing from Seroquel. In addition, here is an important article on some insights on histamine that made it possible for her to successfully stop Seroquel. My second miracle is about a woman who had a stroke in April 2016 that completely incapacitated her. She recovered from it and regained her mobility and most of her cognitive function. About 2-3 months ago, she began experiencing numbness in her right foot that progressed up her leg, until it reached past her knee. Her numbness terrified and overwhelmed her. She went to the very best neurologist she could find in NYC and received multiple tests, but her condition did not improve. I had been her psychiatrist for just two months (since April 2018), and for most of that time, she was living in New York. I also knew that she was planning to fly to Europe for an extended stay (until October), so I started off the session saying that I didn't think I would be of much help to her in the interim and that we should schedule our next appointment when she returns in October. She, surprisingly, disagreed and said that she needed emotional support from me. I didn't feel qualified to help her with her numbness, but emotional support I could do. I suggested that we could reduce her anxiety about her numbness with EFT. With tears streaming down her face, she worked on releasing her fears about her numbness. Then, we did a second round of EFT on her body holding the trauma of her stroke to help her body release the trauma. After that, we did some Energy Breaths, setting some positive healing intentions. The whole healing session took about an hour. It was after I took my hands off her head, that she said, "I can feel the sole of my foot, the leather in my shoes!" She said that she had felt a tingling energy in her leg, and when she stood up, she was able to maintain her balance more easily. The tears that streamed down her cheeks during her EFTs burst forth even more as she wept in joy. I was amazed, to say the least, and very happy for her. I guess I will conclude by emphasizing how grateful I am for being able to be a part of my patients' healing journeys. When I was young, I thought that love and joy would come to me if I were rich and famous. I wrote for love and won awards for my writing in hopes that I could be loved for my achievements as a writer. When I abandoned that path, it was because I wanted to find the kind of joy and love that could be felt through service. During a dark time in my life, when I was 17, God sent me a spiritual experience in which I had a vision of myself helping a little, old, frail lady cross a street, then I felt an incredible feeling of joy and love fill me at the same time--a feeling that I had never felt before. From that moment, I knew a greater love and joy existed out there, and I wanted THAT. I have worked hard to live in THAT kind of love and joy, and when a patient crosses the road of life and achieves something wonderful through their healing journey, I re-experience the deep, ineffable joy of service. I guess my newsletter was about three miracles, rather than two.